Thanksgiving is just days away! I’ve tested everything and finalized the menu. I’ve also given myself a little bit of a break from the kitchen over the weekend. The most complicated thing I made was tomato soup (from a carton) and hot dogs loaded with kraut, grainy mustard and pickled jalapenos! Lame, I know. This recipe is left over from last week and I never got around to posting it. It’s a simple weeknight meal you can prep in the morning or on the weekend and pop in the oven when you get home from work. It doesn’t sound like much, but the cheese bakes and browns and bubbles in the oven, taking this casserole from plain to super delicious. More casserole fun tomorrow, then I’m kind of on a break for the rest of the week, pigging out and eating leftovers! Make this up to a day ahead. You can also freeze it and bake it covered for 30 minutes, then uncovered for another 35 minutes. Preheat the oven to 400°. Set a skillet over medium heat and cook your sausage through, breaking up any large crumbles with a wooden spoon. Once they’re cooked and browned, about 15 minutes), stir in the jalapenos and remove from heat. In your biggest casserole dish (the bigger the dish, the more baked cheese you get), toss the brown rice, broccoli and sausage. Whisk the milk, eggs and garlic salt together in a separate bowl. Stir in the cheddar cheese and pour over the casserole dish. 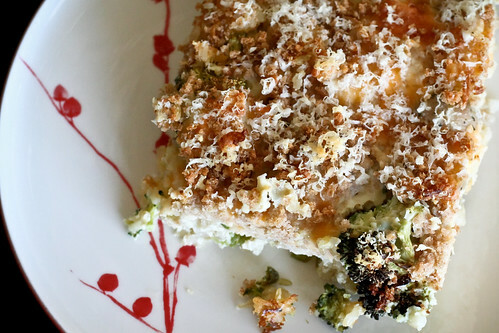 Sprinkle the breadcrumbs and Parmesan in an even layer over the top. Bake in the center of the oven for 35 minutes, or until the middle is set and the top and sides are golden brown. Now – how good does this look? I love this! I found this from tastespotting and just wanted to drop you a line saying that I am making this RIGHT NOW! Waiting for the rice to finish! Thanks!